With Teamup Calendar, the team at Vintage Wine Estates schedules and tracks ten million gallons of wine every year with efficiency and ease. Vintage Wine Estates is a family of independent wineries and producers whose singular focus is on producing the finest quality wines and incredible customer experiences. 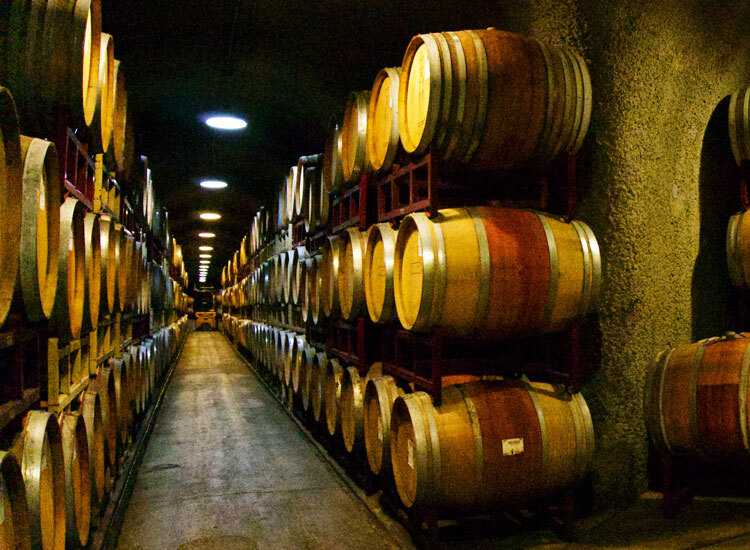 At Ray’s Station, the largest bottling winery in Mendocino County, California, Vintage Wine Estates produces over 4 million cases of wine per year. Since we truck in close to 10 million gallons of wine per year, we have the challenge of scheduling and tracking all the wine tankers. These tankers haul all over California & Oregon. Previously we have used Outlook, but this method failed us when all of our company servers were down (due to a virus attack) and we could not use Outlook at all. After several very frustrating days, I finally went online to see if I could find a free calendar, and we found TeamUp! Everyone is happy with the calendar, which only took about 3 hours to setup & no one wants to go back to Outlook. 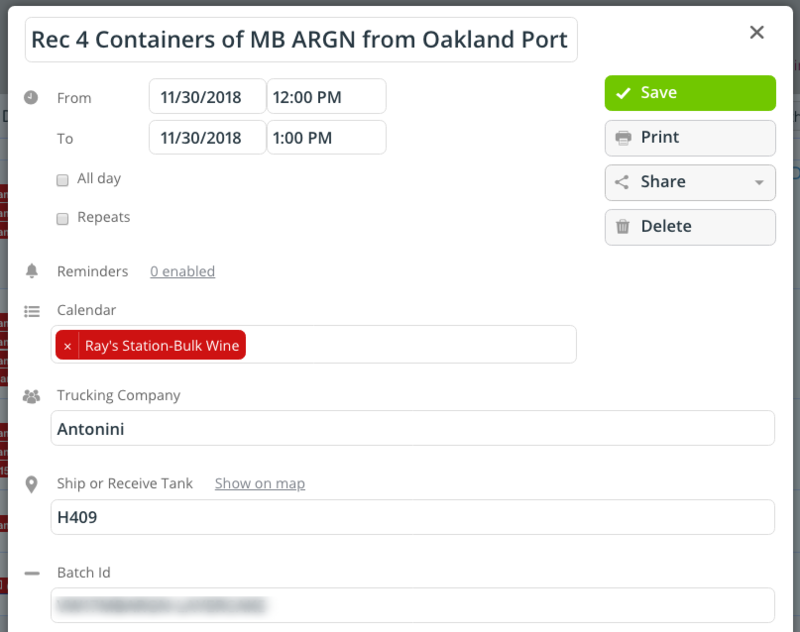 We’ve set up the customized event fields to allow entry of the trucking company, the wine blend id, and the receiving wine tank. One of my favorite features is the search function. I also use the copy function often, since we sometimes ship the same wine over multiple days. 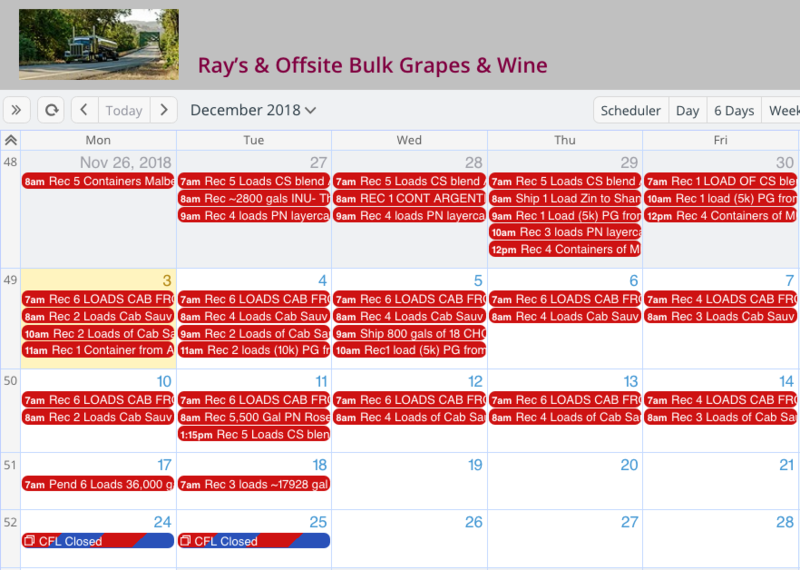 We have separate calendars set up for offsite wine storage deliveries, grape harvest truck deliveries, and regular bulk wine deliveries. Customized event fields capture the relevant information. Teamup has helped me to efficiently and accurately manage the movement of wine from our suppliers and offsite storage locations. Everything I need to know is located on each shipment on the calendar. It’s saved me countless hours of time because it is so easy to use and manage and doesn’t go down even when our servers are down. 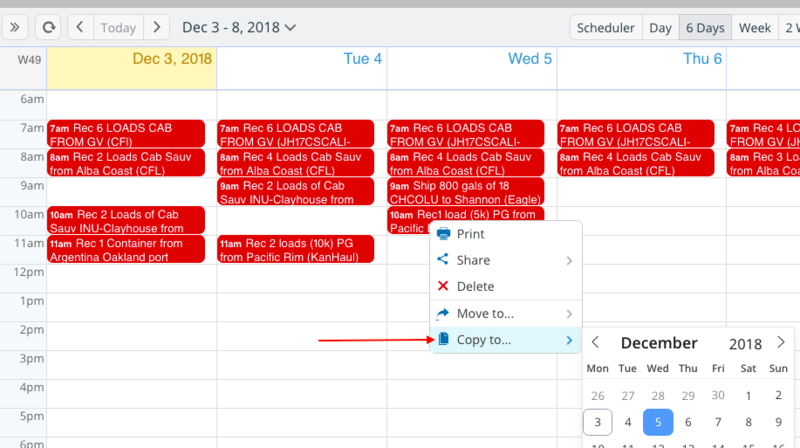 Keeping track of wine and grape shipments is easier with a Teamup Calendar. There are several features that make Teamup Calendar a great fit for the team at Vintage Wine Estates. Custom event fields: The ability to create custom event fields the team to collect and track the data that’s relevant for them. No wasted space, only a completely customized calendar that works for their needs. Search function: Built-in filters do the work, filtering by keyword, by sub-calendar, by custom event field, or by any combination. Filters make it easy to find the events and information needed quickly and easily. Copy function: right-click on any event to open the context menu, which includes the option to Copy to or Move to another date. With a couple of clicks, any event can be duplicated to another date. Right-click an event to open the context menu and copy or move the event. Thanks to Brenda Reed for sharing your story!